A black and white photographic post card of the public library in Whitby, Ontario known as the "Carnegie Library". This library was created through a Carnegie grant and was known as a Carnegie Library. 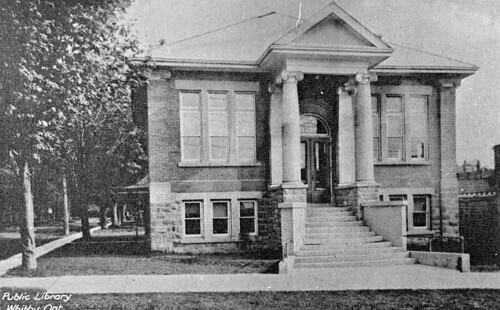 Construction for the Carnegie Library began in early 1913 and the building was opened in 1914 at the north east corner of Dundas and Byron Streets. The building housed approximately 5,000 books and served as the town's library from 1914 to 1973. Bottom Left: Public Library, Whitby, Ont. Scanned from a copy photograph.